Home » Blog » Dog Leashes » Rope Dog Leash Buyers Guide with Tips and Suggestions. Rope dog leashes are among the best and strongest leashes available when built with quality rope and hardware. This straightforward and traditional leash design is both durable, easy to use, safe, and the best way to communicate non verbal leash commands when walking or training your dog. We use only new rope manufactured in the USA. Climbing Rope makes an excellent dog leash and is used exclusively in all of our rope leashes. Unlike lesser quality leashes, climbing rope is tested by the manufacturer to meet strength and safety standards within the climbing and or mountain rescue industry; this ensures that all our rope leashes are consistent in quality, strength and durability and perfectly suited for the pet industry. We use only new rope manufactured in the USA. The pet industry has no leash standards or quality control that I’ve ever noticed. Too many leash manufacturers use low quality parts including what they call “climbing rope inspired” but not real climbing rope; others cut corners and use what is commonly called “ends”, or recycled rope no longer suitable for its original purpose of climbing and or rescue work, but despite this its assumed good enough to build dog leashes – wrong. I strongly disagree with this practice as the rope is considered unsuitable or unsafe by the rope manufacturer or third party source. I believe strongly that a dogs leash is its life line between you and harms way. Using anything other than new climbing rope to build rope styled leashes can be a risk to our dogs safety. In my eyes this is not acceptable. Dogs don’t ask for much or anything, I see no need to cut corners and build rope leashes with used, recycled or left over parts. Dogs running free in unfamiliar territory can easily become lost or worse. It was time to step up and provide my dogs with quality rope leashes and eventually build these myself. Long before I considered the idea of building and selling my version of a quality dog leash, now copied by many companies; I did what most of us do who enjoy dogs, I purchased a pet store dog leash for each of my large dogs thinking I had made a good choice. I saved a few bucks on the recycled rope, it was just a leash I thought, both failed within days of purchasing them. I tried to contain my panic attack as my big dogs ran off into the woods, and myself tracking behind them aware of the steep mountain cliffs and other dangers ahead. Trained dogs with high prey drives can suddenly become deaf to any commands frustrating their safe return. Eventually we managed to find each other before dark; we were cold, wet and muddy, but safe. Two of the three of us seemed to enjoy what could have been disastrous. Dogs deserve the same care and concern for their safety as you and I. Dogs deserve the same care and concern for their safety as you and I. 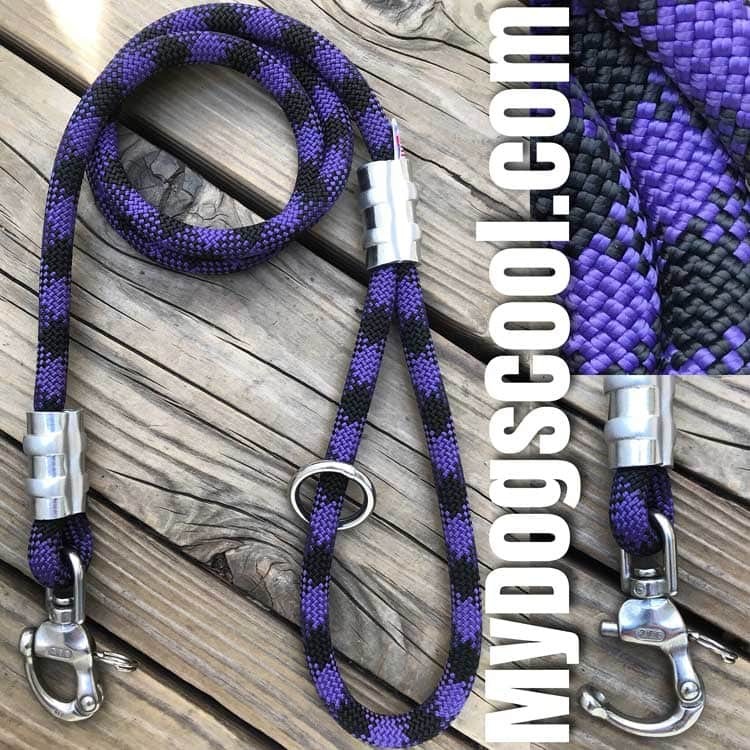 Dogs deserve the best we can provide them; a reliable rope dog leash is a great start, it’s exactly what I build for every customer and their awesome dogs. Here’s a breakdown of the different rope leashes, hardware options and their intended use. When selecting a leash for our dog we must determine how the leash is to be used, what activities we will be engaged in and the environment we will be exposing our dogs to. Dogs being walked in high traffic areas do best when on a short leash kept safely at our side whereas a longer six foot leash may be more suitable for parks or basic obedience training. There are no set rules here as rope leashes can be used in a variety of ways with different dogs and different training techniques. Sometimes its a simple decision to use a long leash to give our dogs more freedom to roam or keep them close for safety concerns. Our six foot climbing rope dog leash is designed for daily dog walks and basic leash or obedience training. It’s a commonly required leash length for puppy training classes and meets most leash law requirements. One of the most popular lengths allowing for both good control and a comfortable walk for most medium to extra large dogs.The short length does not allow the handler and dog to comfortably face each other and work on basic obedience skills, instead use this length for walking dogs in a suburban environment on sidewalks or anywhere where you need to keep your dog close at your side. These are ideal for maximum control and routine walks with large dogs in high traffic areas, crowds of people, or used with extra large dogs that are normally relaxed and enjoy walking at your side, but have the muscle to take you for a walk should they decide to take off after that squirrel you failed to see. Any leash can be equipped with a carabiner for added strength or safety. Its important to know that carabiners do not swivel. For most this is not a concern and the added safety is worth the occasional tangled leash. We uses only professional grade forged aluminum compact locking carabiners. Slip leads are most popular with dog trainers, kennel work, veterinarians, and very popular in Europe. Slip leads are a simple design not requiring a collar; they tighten as the dog pulls and loosen when the dog is walking calmly. At no time should a dog be tethered or unsupervised with this style leash. four foot slip leads are best, six foot are the longest we make, anything longer does not allow the slip lead to loosen completely when the dog is walking calmly. A traditional German or European hunters leash used with bird dogs allows a person to wear the leash over-the-shoulder and keep a trained dog walking at your side. This style leash is also very popular for hiking and jogging with medium to extra large dogs. The stainless steel clips are recommended but can be upgraded with carabiners. The Jaeger leash is eight foot in length, this gives the dog approximately four foot of leash with the other four foot looping around the handlers shoulder and upper body. The leash length is adjustable by a simple sliding the O ring on the main section of the leash. Joggers will wear this style leash like a belt. Our most popular leash design uses a professional grade swivel manufactured in the USA for mountain rescue teams, firefighters or any organization engaged in different types of rescue work, rock or mountain climbing. The strength, compact size and light weight of the swivel makes it an exceptional choice for large to extra large dogs. The Ultimate Dog Leash was an exclusive design originally made available to US military K9 handlers and US Secret Service K9 Teams. It has proven to be an excellent dog leash for the largest of dogs. If you’re lucky enough to have two or more dogs in your life then you might consider a two foot coupler that connect to a single carabiner leash. This can help walk two dog where the dogs learn to walk together and the handler isn’t pulled in different directions. Our Double Dog Coupler comes standard with stainless steel swivel clips suitable for medium to large dogs and can be upgraded to use carabiners or our Pro version that uses both carabiners and swivels. Rope leashes equipped with a stainless steel quick release where originally intended for police K9’s where the officer required a fast one hand release without the need to look at the clip to remove it. The quick release has a spring loaded pull pin that requires about a 3lb pull force to open. Unlike a traditional style clip or snap found on our standard leashes that will need to be opened and maneuvered so its not still attached to the dogs collar or harness; a quick release will fall free from the dogs collar even with a dog leaning into the leash anticipating being let loose. If you don’t have full control of your dog then a quick release may not be for you. A second handle is a good idea for most leashes especially with dogs that may get overly excited, have high prey drive, overly protective or aggressive. The second handle allows that extra control to pull the dog close without needing a lot of grip strength. Rope leashes have used traditional style snaps or clips with the sliding catch bolt that is opened with your thumb, these have been used for what seems to be forever with great success; not all of these traditional style clips are built with the same quality materials and have the reliability one should expect. We use a marine grade 316 stainless steel clip for our basic leashes, this clip style is popular with ocean divers and various marine applications, these are superior to nickle or chrome plated clips used on similar style dog leashes. I routinely source parts outside of the pet industry where the demand for quality is highest. We are the first to build rope leashes using a customized single piece rope connection, all other company’s building look alike leashes have done nothing more than try to copy our design, some fraudulently passing off their leashes as ours. If you didn’t purchase direct from us, you don’t have a quality leash I built. If you like, I’m more than happy to build you and your dog what I believe is the best rope dog leash made in the USA. For questions please feel free to send an email, this is the fastest way to contact me. Jaeger Hands Free Dog Leash with stainless steel clips, and optional handle AKA Power Grip. Double Dog Coupler with stainless steel swivel clips.